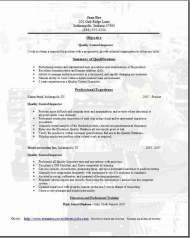 This example resume will help you to capture attention to any prospective employer looking at it. Yes, it will also contain example information that you will need to replace. 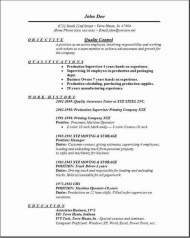 This is provided so that you can see the total end look of the resume after completion. So yours should look almost the same way. Location after you download your resume should be the desktop. Easy to find. These are the best 3 resume formats people need to use while creating their resume. Go ahead today getting started. Try to mix things you like on your resume from our websites other pages that you like. 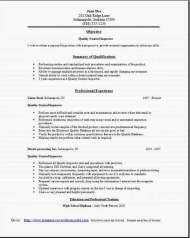 I know these free quality control resume are a must have and very useful to you. They will look very neat and professional when you are done. Some manufacturing facilities do not produce most components, that are installed with a particular product, but some of them are purchased from industry manufacturers. Articles when purchased from other manufacturers need to meet the exact specified standards and also need to be in working and in perfect condition. Therefore they must be inspected for incoming defects. Any electrical device testing will take place with the utilization of all the necessary equipment available. It is impossible to examine every item coming in from outside vendors with this particular type of testing so only about fifty or possibly a hundred of these articles contained in any consignment are really being tested. Self-inspection on an assembly line has now resulted in a lower number of quality inspectors that are needed. Almost all companies have inspectors only at major points on the assembly line. The inspectors, who work on the production lines, can be found along major production points during the manufacturing process. So the inspectors job is to make sure that each and every component is microscopically checked for any and all defects and not overlooked for quality specifications, it does not make any difference how slight or minute that small mistake is. Inspectors are always provided with a huge list of items, which they must examine and perform quality inspection test on. They will have to manually mark off every item when the inspection is completed and record the test in computer software. If that inspector during their testing finds any faults along the manufacturing different sections, those faults will need correcting or replacement components need to have been provided.